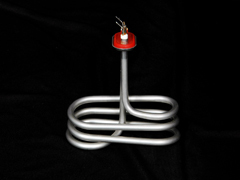 Description :	Spiral heating wire is inserted inside a SS tube with fused magnesia powder filled around wire coil for electrical insulation. Passivation is carried out to prevent tube from rusting during fuctioning in the water. Thermal fuse is provided from overheating protection.